We are starting a new article today on Fireflies and Jelly beans: Spotlight Suday. It will be where we spotlight a cute tutorial that we think you might want to try! It cames from Cheryl at Sew Can Do. Find out how to make it here. 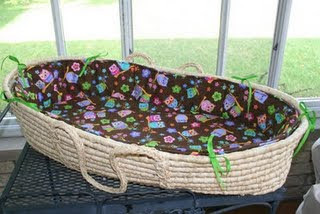 I love the idea of reusing a basket, but making it special for the next baby!